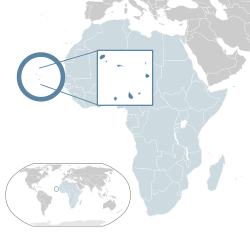 For ither uises, see Cabo Verde (disambiguation) and Cape Verde (disambiguation). Cape Verde /ˌkeɪp ˈvɜːrd/ (Portuguese: Cabo Verde, pronounced: [ˈkabu ˈveɾdɨ]), offeecially the Republic o Cabo Verde, is an island kintra, spannin an archipelago o 10 islands locatit in the central Atlantic Ocean, 570 kilometres aff the coast o Wastren Africae. The islands, kiverin a combined aurie o slichtly ower 4,000 square kilometre (1,500 sq mi), are o volcanic origin an while three o them (Sal, Boa Vista an Maio) are fairly flat, sandy an dry, the remainin anes are generally rockier an haes mair vegetation. Acause o the infrequent occurrence o rainfaa, the oweraw landscape isnae parteecularly green, in maugre o whit the kintra's name suggests (verde is Portuguese for "green"). The name o the kintra stems insteid frae the naurhaun Cap Vert, on the Senegalese coast. ↑ John Kerry (July 8, 2014). "On the Occasion of the Republic of Cabo Verde's National Day". U.S. Department of State. Retrieved July 11, 2014. On behalf of President Obama and the people of the United States, I send best wishes to Cabo Verdeans as you celebrate 39 years of independence on July 5. ↑ Neto, Octávio Amorim; Lobo, Marina Costa (2010). "Between Constitutional Diffusion and Local Politics: Semi-Presidentialism in Portuguese-Speaking Countries". Social Science Research Network. Retrieved 29 December 2015. ↑ 3.0 3.1 3.2 3.3 "Burundi". International Monetary Fund. Retrieved 13 January 2015. ↑ "GINI index". World Bank. Retrieved 26 July 2013. ↑ "2015 Human Development Report" (PDF). United Nations Development Programme. 2015. Retrieved 14 December 2015. ↑ Tanya Basu (12 December 2013). "Cape Verde Gets New Name: 5 Things to Know About How Maps Change". National Geographic. Retrieved 2013-12-12. Wikimedia Commons haes media relatit tae Cape Verde. This page wis last eeditit on 6 Januar 2019, at 17:49.